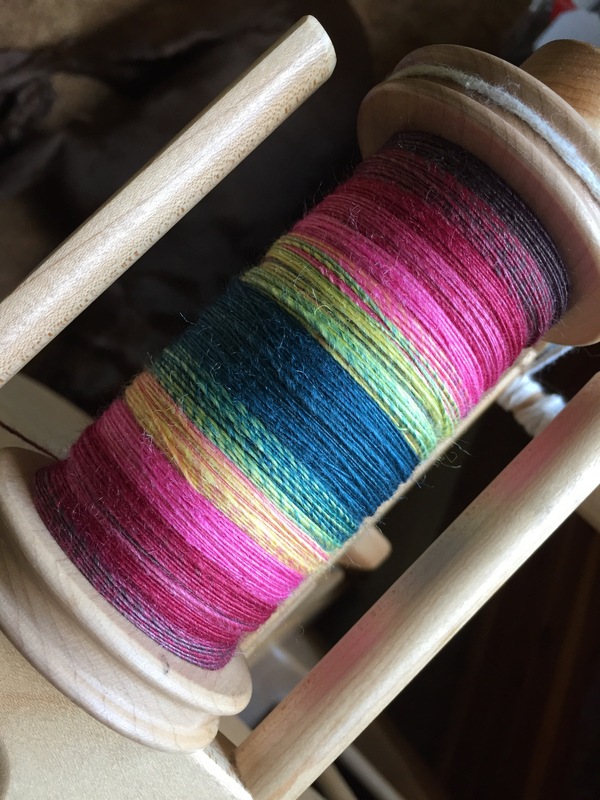 I really do love being a part of the Three Waters Farm Ravelry Group because there is always inspiration, there’s always something happening. January and February this year — like last year — the group is doing an SAL + KAL focused on Susan Ashcroft, or Stitchnerd, Designs. Susan is a master of potato chip knitting patterns and they are often, if not always, written to be very adaptable. 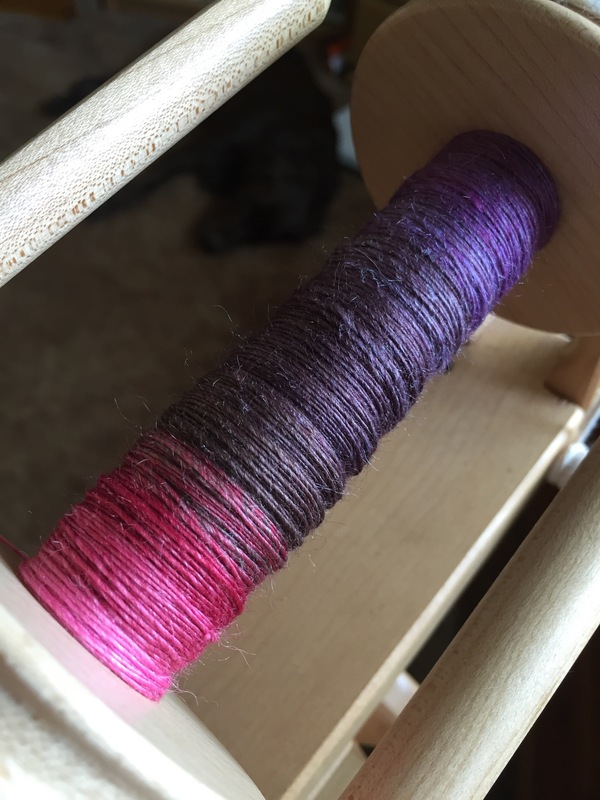 It’s an attribute that I really appreciate as a spinner who isn’t always perfect in producing the yarn in my mind’s eye. I mentioned my Stone House + Light Relief project earlier this week and while I do have another couple braids of fiber that I plan to spin and then knit into a Winterplay in February, I actually still had at least 2 yarns I’d spun last year specifically for some of Susan’s designs. Happy with my Light Relief finish, I hopped right into another project. 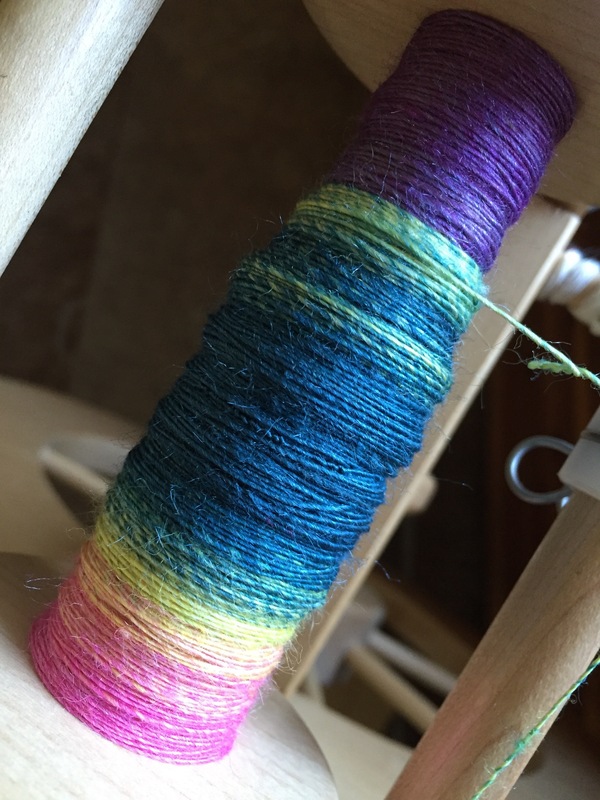 September’s Top of the Month Club colorway named, Summer’s End, on a BFL/Tussah Silk blend. It turns out that looking back this may just be my worst documented spin ever, unfortunately. I have exactly 4 WIP photos. And then the trail of photographic evidence of this skein completely disappears. 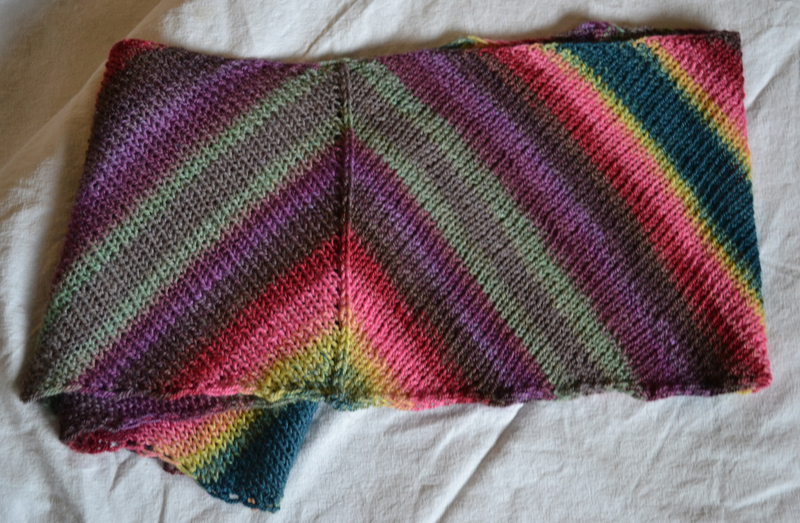 I think Spinzilla crept up right on the heels of finishing it and then I just forgot to take finished photos. Suffice to say, I chain-plied it. Of that I’m positive and I wound up with 235-ish yards, I think. Not realizing the lack of photos, of course, I wound the skein and started knitting without any. Whoops! Anyhoo, after I printed the Yarn Optimiser pattern for which I spun this yarn, I’ll admit I was excited to knit away on it, but not as excited about the weighing involved. I’d been totally spoiled by the particularly ‘light’ brain requirements of Light Relief. I got going nonetheless. I’ll admit that once I got going it was really kind of fun and fast. I was wary of the edges and how it could possibly block out evenly, but I carried on because aside from having to stop and weigh things now and then, it was just super easy and fun to watch take shape. As with my other Stitchnerd Designs, I was done in the blink of an eye. And the blocking did mostly work out. I’ll admit that I rushed it a bit and there are some little peaks from the pins where I really should have used blocking wires. Yes, blocking wires would have been smart, but I was in a rush. I may block it again when I’ve got a little more time (this was admittedly rushed), but I also may just wear it and not be such a perfectionist. Maybe? I think stranger things must have happened somewhere once probably. 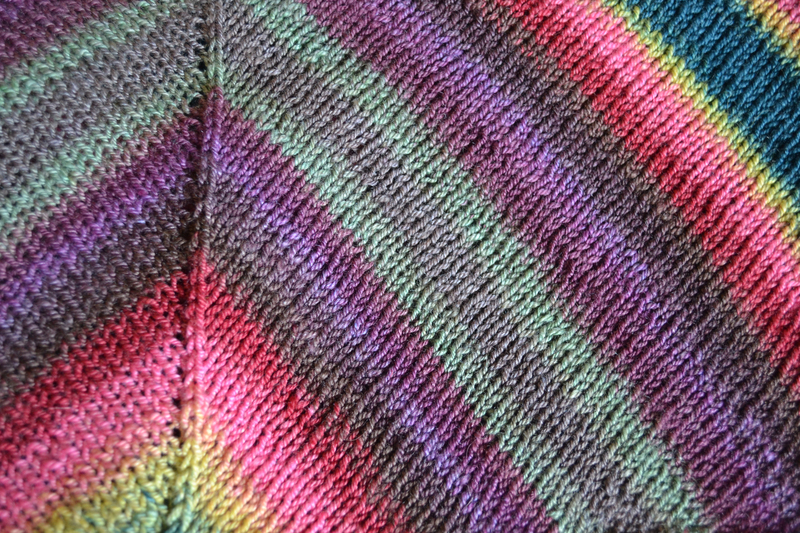 Sub-optimal blocking aside, I’m really pleased with how it turned out. 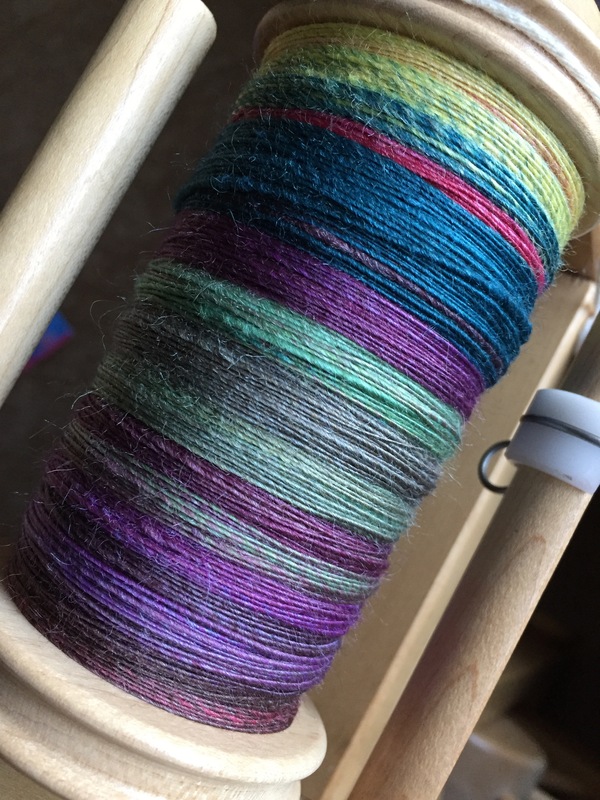 It really is just as I’d hoped when I spun it and I think it was just the perfect fit for my purposes for this colorway. It’ll be just perfect for spring, I think. Summer’s End, Spring Beginning — either way, this one works for me! And that, my friends, is that end of my parade of FOs. I hope it’s been as fun for you as it has been for me. Coming up, I’ll be back to my regularly scheduled (mis)adventures and sharing my projects as they slowly come to life. As you well know, there’s always something happening on my needles, wheel, spindles, loom, and…well, you know, life. I really like it and, of course, have bought the pattern! 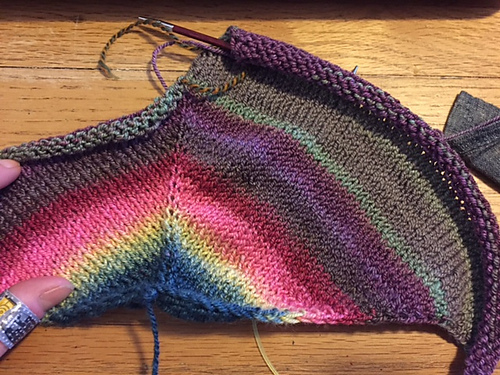 I love a pattern like this that allows me to use the whole skein and show off the yarn while not being bored with the pattern. Thanks! OH>>> and love the yarn too! Awesome! 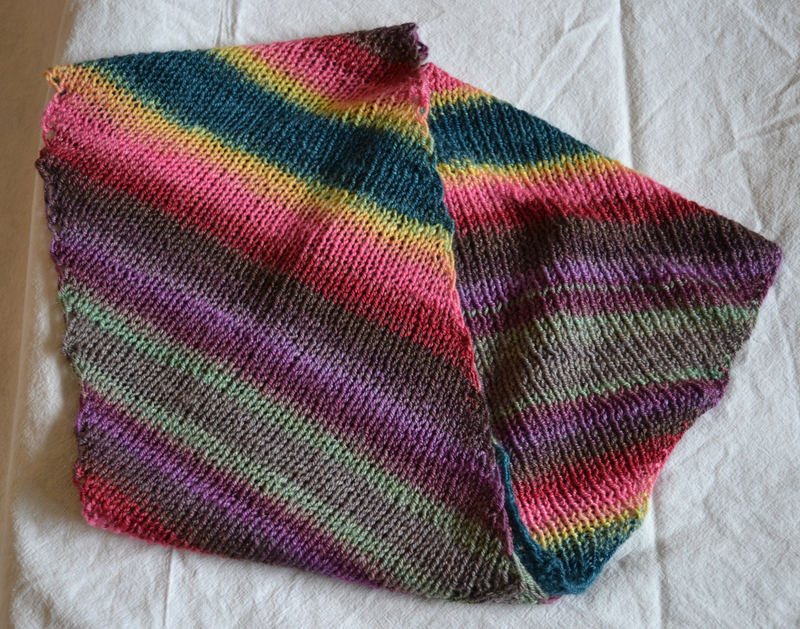 It does require some good blocking, but it’s a super addictive pattern – enjoy! Very pretty, love the yarn and the FO. Nice and cheerful, it will seem like spring on a gray day.